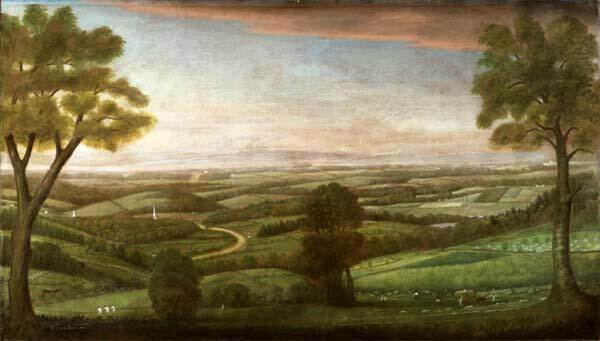 According to local tradition, Colonel Thomas Denny, Jr., commissioned Earl to paint this panoramic view of Worcester, Massachusetts, shortly after Denny had moved from his family's hilltop homestead in Leicester to a house he had built nearby. Apparently Denny wanted to take to his new home a memento of the commanding prospect he had enjoyed since childhood. Earl was a logical choice for this unusual commission, in part because he had also grown up in Leicester, and he undoubtedly knew the Denny family. Following seven years (1778-85) in England, where he had studied with Benjamin West (q.v. ), Earl became a noted portrait painter of merchants and professionals in New York and New England, often setting his subjects against a landscape background of the region. He was one of the first American artists to raise landscape above the level of purely decorative or fanciful scenes and house portraiture. Contemporaries admired the accuracy of his view depicting two churches in the town of Worcester and the Boston Post Road meandering eastward through the rolling spread of cultivated fields.